I’m writing from the computer lab in the Research Vessel Atlantis. We are at sea in the Pacific. This is our offical blog. Among us there are English, Spanish, French and German speakers, and we will identify our language as we post. There are 22 of us among the science crew on this cruise. The clock just turned over to day 3 on the Atlantis. 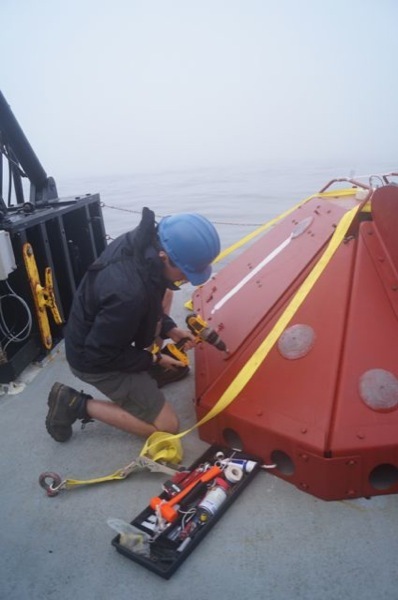 To date we’ve recovered 3 ocean-bottom seismometers (OBSs) that have sat on the ocean floor off the coast of northern California, Oregon and Washington for the past year. Our job on this cruise, leg 3 of the Cascadia Initiative is to recover the remaining 30 of the 70 OBSs deployed last year. The next 3 cruises this summer will re-deploy those OBSs in the northern part of Cascadia to record until next year. What’s “Cascadia” you may ask. Its bounded by a spreading center on the west, a place where brand-new Earth’s crust is made and moves towards the coast. To the east are the volcanoes created by this ‘oceanic plate’ moving below (or ‘subducting’) the less dense North American plate that people in the U.S., Canada, and part of Mexico live on. Why study Cascadia? It is known to have very large earthquakes, just like recent ones in Japan and Sumatra. And just like in those places, Cascadian earthquakes (scientists call them ‘megathrust events’) can cause large tsunamis. 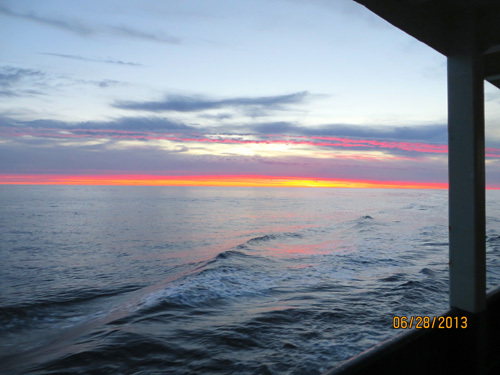 This entry was posted in At Sea on March 29, 2016 by asmet@uoregon.edu. Day 3 on the Pacific, cruising on the research vessel (R/V) Atlantis. We’ve all had a long day. First recovery this morning the mechanism for releasing a float tied to the ocean-bottom seismometer failed. ROV Jason to the rescue however. A bit of a ‘thunk’ with one of Jason’s remote-controlled arms and the OBS released it’s ‘pop-up’ buoy. Reminded me of how my dad used to ‘fix’ our old-style TV when it malfunctioned, a whap to the side applied just so. Our second recovery posed other challenges. 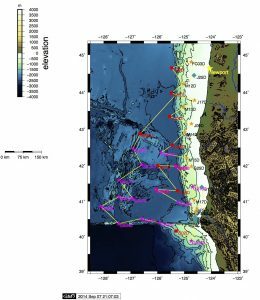 There were strong currents at the site, some 900 meters below the surface off of Waldport, Oregon. The Jason crew had their work cut out for them to tie a rope on a spool to the OBS so that the rope would surface and we could haul the OBS to the surface. Thanks to the expertise of the (crackerjack) Jason crew, problems solved, OSB recovered. Hello everyone. It’s Katie blogging in English. Its Friday morning at 00:47AM and I am currently working the graveyard/night watch (00:00 – 04:00). As Lexie mentioned, people that get sea sick is random and unfortunately, I was one of those people. I am happy to report that everyone who got sick seems to have gotten their sea legs and acclimated. Now that my health is back, I have been enjoying the delicious meals prepared for us – a huge upgrade from the saltine crackers I was living off of before. I also enjoyed observing the Jason recovering yesterday (Thursday 27th). I sat with several other people in one of the science labs watching the feed from the cameras that are mounted on the Jason. It is pretty amazing to see all of the wild life as the Jason descends throughout the water column. We saw a squid swim by the main camera, lots of clear gelatinous creatures, sea stars, crabs and various species of fish. The ocean floor at ~900 m at the station yesterday was quite soft and the OBS that we had to recover was slightly burried around its edges. We also noticed flakes of the white paint of the OBS on the sea floor – someone on the OBS team explained that the biofouling paint is designed to flake off when algae attaches and accumulates on the OBS. The recovery went successful and now we are currently in transit to our next station and hoping to begin another recovery around 05:30. On to the next OBS! Hi everyone, this is Haley! We just picked up J17B (another TRM Ocean Bottom Seismometer) using the Jason ROV and Medea’s assistance and we are on our way to the next one, M10B. The water is extremely calm and smooth out here today and the weather couldn’t be better, lots of sun and not too much wind. The trip is going by so fast, there is constantly something to do on the boat between filming, watching bathymety surveys, helping on deck, and trying to fit in sleep somewhere! I have attached a picture of a grapefruit sized cluster of fish eggs that were attached to the antennae of the very first OBS we pulled up as well as a photo of a few dolphin friends we have made along the way, I’m surprised they aren’t out and about today! 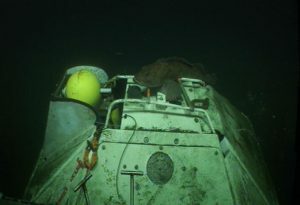 I also attached a picture of the Jason being brought back onto the deck after a mission as well as an OBS elevator in the water. Enjoy all!! It’s day 5 of the R/V Atlantis cruise. Honestly, it feels like we’ve been out at sea for a little over a week, but at the same time it feels like we’ve barely left Astoria (Oregon). The days just seem to slide into each other, not bothering telling you their names, nor their hours. All there is the work, the research and the seismometer recoveries. Each melding into the other, like some sort of sweet smelling, salty tasting stew. I’ve been working on the educational outreach aspect of our mission. This means that I work on the video systems, multimedia presentations and the multi cast/live streams from the JASON. The last one is particularly fun, mainly because I get to see what lives at the bottom of the Pacific from a semi first person perspective. It’s also fun seeing a room full of physical science and engineering majors/professionals try to name the various animals that they see without having any particular background in biology. Futility has its entertainment values in specific conditions, I suppose. The weather in the open sea has been amazing, I must admit. When I first set out, I had this image in my head where we’d be battling 40 foot swells and fighting the elements everyday. The first few days of sea sickness cured me of this fantasy. Every morning after that has been more beautiful than the last. Calm seas so smooth that they look like the most reflective polymers; The sun so bright that its light seems to caress every cell in your body, like the beams were crafted just for you; The clouds so distantly soft that you almost want to pluck them from the sky and use them as a pillow; The wind so sweet that you can almost hear the songs that you want it to sing. Sometimes I look at the water from the side of the Atlantis, and I have to resist every urge to jump into the water. The water laps at the hull of the vessel, every gentle touch acting like a siren’s song. If I were to jump in, I’m pretty sure that would be the end of the mission for me. Overall, I’m appreciative of the experience. I’ve learned much about how research is conducted in the field, and it’s nice getting to know other people who have similar academic interests as mine. I’d recommend it for anyone interested. hope you all enjoy it and have a fantastic night! We’re sailing obliquely across the swells, bearing northeast towards the ‘hydrate ridge’ off of Oregon’s coast. These past 3-4 days have been tough, an unusual weather pattern settled in with a low stuck over California and a high over the Pacific Northwest. As a consquence, winds built out of the northwest to gale force, approaching 50 knots (that’s more than 50 miles per hour) and whipping the seas into a froth of confused waves riding growing swells. We had a spate of good luck early on, in that the rough weather we saw coming out of Astoria calmed down. We left deep water ocean-bottom seismometers for later and focused on the ‘TRMs’ (trawl-resistant mount) OBSs that were recovered from shallower water. Some of those involved Jason dives through spectacular sea life– a shark, squids, big ugly fish, thousands of brittle and sea stars, shrimp. Jason dove to the rescue for one ‘pop-up’ TRM when its buoy, attached to line attached to the OBS, didn’t pop up. So, just when our window of good weather was closing, we finished all but 3 of the 30 OBSs we sought to recover. Then it became a game of cat and mouse with the growing, bad weather. Mostly, we were the mouse. We cruised north up the coast, sat on a site in rough seas where we couldn’t recover, then cruised north even more. We had a bit of weather where we gathered in the final three deep-water OBSs, the kind that drop anchor and float to the surface on sonic command. We then beat our way out through growing seas to the site of a lost OBS. As with 2 cruises before us, we tried to communicate with that OBS (we do this with transponders that send sonic signals to it), but to no avail. We set up in different positions around it in case it was sitting on its side, restricting the directions in which it could communicate. The big problem was the weather, here we are in a ship equipped with Jason, and the seas were too rough for a dive. We pulled out of that lost OBS site and travelled N, again beating against high seas, and did similarly with another lost OBS. Again, many attempts from several positions and no communication. And, again, weather and seas too rough to call in the Jason cavalry to the rescue. So here we are on our way back to port, via a ridge known for its gas bubbles. 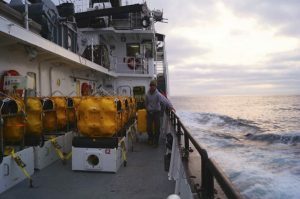 We’ll sit on that overnight and use the ship’s sound-based bottom-mapping system (swath bathymetry) to instead image gas bubble plumes as they rise over the ridge. We’ll pull off that site at about 3am and head back to the mouth of the Columbia. General impressions: we made a few good calls early in the cruise regarding weather and where not to go next. 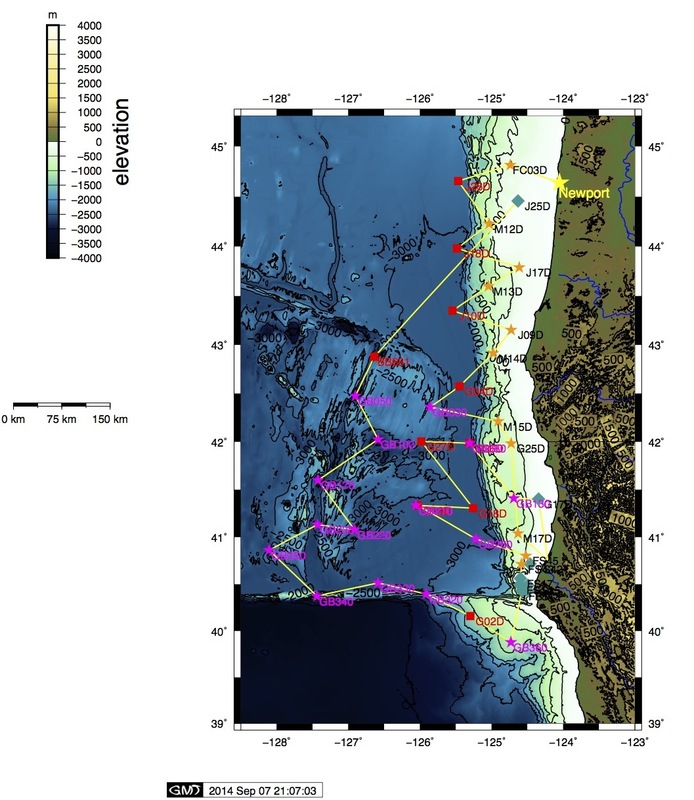 These combined with long days allowed us to collect the 20 OBSs in the ‘pop-up patch’ near Eureka, CA and Cape Mendocino, and important geological feature where the San Andreas Fault, the Mendocino Fracture Zone, and the Gorda plate spreading center all meet. We pulled those up just in time. Then we fought weather to finish the original 30 and try to recover the ‘lost boys’ further out to sea. We imaged deep gas vents in various places. We got to sit in the Jason control van and take pictures, make notes, otherwise bask in the cool geek glory. We’re worn out but happy. 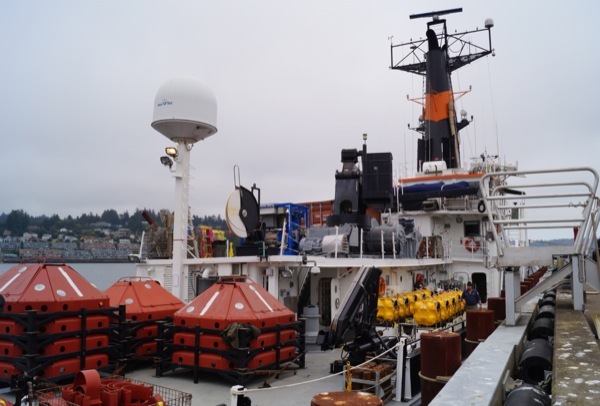 Year 3 of Cascadia is ready to transition from its third recover mission to its 3 deployment cruises later in the summer, where the ‘footprint’ of OBSs moves north to the coast of northern Oregon, Washington and BC. Hooray! Dean Livelybrooks (aka ‘Dr. D.’) reporting on 1-September, 2014. We’re getting ready to start a 20 day cruise aboard the Oregon State University-operated R/V Oceanus, departing from Newport, Oregon. 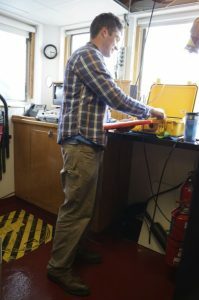 Our mission is to deploy 29 ocean-bottom seismometers (“OBS’s”) that will sit in dark solitude for the next year recording seismic signals and water pressure changes on the Juan de Fuca and Gorda tectonic plates offshore from the Pacific Northwest. We are also charged with recovering 15 other OBSs that have done just that, so that data can be recovered and the instruments refurbished for their next mission. Well, I’ll sign off for now. Look for more about the scientific objectives of CIET and impressions of life at sea from our crack team of Oceanus sailors, coming soon. 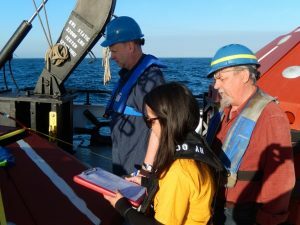 Dr. D.
I’m Magali, one of the five volunteers onboard the Oceanus, a 177 ft (54 m) research vessel owned by the National Science Foundation and operated by Oregon State University (OSU). Figure 1: The Oceanus research vessel docked at Newport, Oregon. On board the ship are four additional volunteers: Jeremy Schultz (UO), Brian Cook (OSU), Stephen Hicks (U. Liverpool), Alex De Moor (OSU), two chief scientists: Anne Tréhu (College of Earth, Ocean and Atmospheric Science, OSU) and Dean Livelybrooks (Department of Physics, UO), five scientists and engineers from Lamont-Doherty Observatory: Andrew Barclay, Carlos Becerril, John Clapp, Ted Koczynski, Walt Masterson, and the vessel’s crew. We embarked on a 20 day cruise from Newport, Oregon to deploy and recover ocean bottom seismometers (OBSs). We are currently on our second day out at sea. So far we have deployed four of 29 ocean-bottom OBSs, two TRMs (FC03D, M12D) and two ARRAs (J26D, J18D) (Figure 2). Figure 2: Map of deployment and recovery sites. The orange stars are TRMS, the red squares are ARRAs, the teal diamonds are pop-up TRMS, and the pink stars are recovery OBSs. We will be traveling from Newport, Oregon to Eureka, California and will loop back to Newport, Oregon. TRMS, trawl-resistant mounts, are shallow water OBSs (the red instruments in figure 1) that use a metal shell to protect them from trawl and sea life while ARRAs (the smaller, yellow instruments in figure 1) are deep water OBSs that lack TRM’s metal shell. In addition to deploying OBSs, we also plan to recover 15 OBSs at a later time. For my future blogs, instead of blogging about our daily activities, I’m going to blog about various aspects of our expedition. What are the student volunteers’ typical responsibilities? 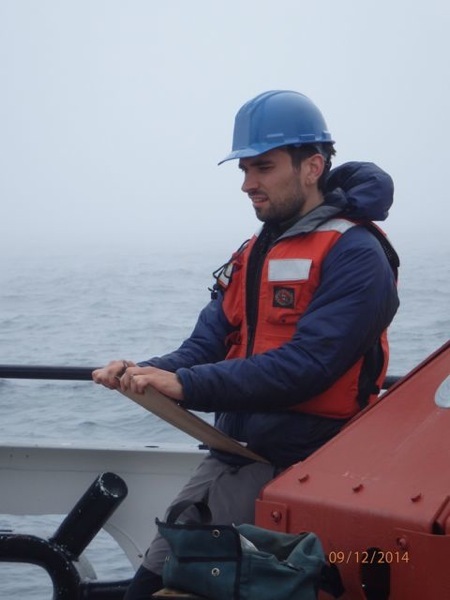 The following blog summarizes our responsbilties as student volunteers onboard Oceanus. During our shift, our primary responsibility is to log time, latitude, longitude, and depth for various steps in either the deployment or recovery process (Figure 1). The log is stored digitally and hand written in case the electronic version is corrupted or lost. In the lab we have 8 screens that stream data as its collected by shipboard instruments. During our shift we keep a close eye on 2 displays, one displaying the 3 kHz and 12 kHz echo sounder readouts and the other displaying the captain’s navigation map. 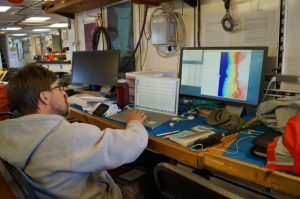 We monitor the former to ensure that we’re above the correct target depth, to notice any unexpected features on the ocean floor (Figure 2)), and to adjust the echo sounder’s phase and range controls as depth changes. We monitor the latter to make sure the ship’s current route plan matches the Science Team’s route to the next station. The navigation display also informs us of the the ship’s heading which we log for non-surveyed shallow deployments. Figure 2: A screen shot of the 3 kHz echosounder’s readout. 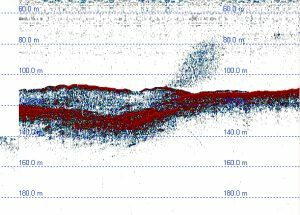 We think that the blob of dots extending from 80 to 110 m is potentially bubbles being ejected from an underwater vent. We keep the white board in the main lab up to date with basic information for the current and subsequent station. The board shows the station name, the depth of the station, what type of OBS it is, and the expected time of arrival. 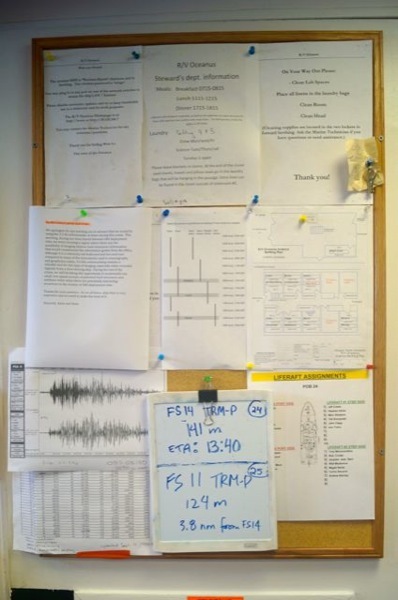 The whiteboard informs the crew of the current station and what needs to be set up for the next deployment (Figure 3). We help the crew move OBS components to where they’re needed for either assembly or deployment (Figure 4). We also help assemble OBSs by screwing in bolts and attaching brackets for the sensor and battery (Figure 5). Going through a detailed checklist after an OBS is assembled assures that all components are secure and functioning before deployment (Figures 6 & 7). After an OBS touches the surface of the ocean and goes into freefall, its depth is monitored by pinging either its external or internal transponder. Once we confirm the OBS has hit the ocean floor, we send it a command to learn whether its sitting upright. If the OBS is sitting upright, we input a release code that detaches the winch from the OBS. The final step during the deployment process is to disable the transponder to preserve its battery life (Figure 8). Awaken the crew members at the times requested. Since the crew members have scattered working hours, to help them rest, we awaken them at a requested time before our estimated arrival at a site. Monitor the lab for any safety hazards. The lab contains many batteries that can catch on fire. Furthermore, ocean swells can cause the ship to move violently, moving objects that are not secured to a surface. Our shifts are scheduled so that at least one student is awake at any time to notice and respond to emergencies.